"the lego movie 2: the second part"
THE STORY - The citizens of Bricksburg face a dangerous new threat when LEGO DUPLO invaders from outer space start to wreck everything in their path. The battle to defeat the enemy and restore harmony to the LEGO universe takes Emmet, Lucy, Batman and the rest of their friends to faraway, unexplored worlds that test their courage and creativity. 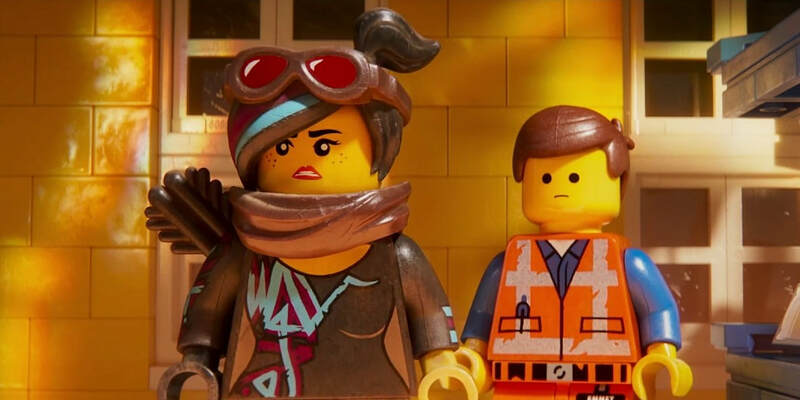 It’s not hard to imagine that I, along with many others, did not have exceptionally high hopes for "The LEGO Movie" when it was released in 2014. But leave it to the incredible talents of Phil Lord and Chris Miller to take a project that could have been simply a hollow cash grab for corporate product placement, and actually turn that into an endearing satire with a strong message at its core. Its snub for the Best Animated Feature Oscar is still one that stings today. It was inevitable a sequel would follow, and like most sequels, it struggles to capture the magic of the first film. However, there’s still enough that’s worthy of one’s attention. The story picks up right after the events of the first film, where after Lord Business’s plans are thwarted, the town of Bricksburg is invaded by a large horde of more cuddly looking toys that eventually lead to all-out war. Five years later, the city is turned into a Mad Max style “heck-scape” of a dystopian world. Emmett (Chris Pratt) is sent onto his quest when Lucy (Elizabeth Banks) and a slew of other main characters are kidnapped by Queen Watevra Wa-Nabi (Tiffany Haddish) for seemingly dubious purposes. Teaming up with a mysterious and headstrong stranger named Rex (also voiced by Pratt), it’s up to Emmett to muster up the strength to save the day again. The inaugural installment to this franchise had the benefit of lowered expectations and delivered a product that exceeded them by a great deal. However, with so many years later, one cannot help but feel the bloom is off the rose just a bit. The metaphors this time around are a little bit more obvious which leads to the storytelling feeling tedious. At the same time, Lord and Miller, who return as writers but not directors, find some compelling emotional depths. Most of that is revealed in the last act of the film, and most of the time leading up to that point feels quite laborious. Still, the humor just manages to clear the bar to become entertaining, even if most of the wit feels quite depleted. It can sometimes be difficult to tell what a change in directors can mean from one animated film to another if one doesn’t have a trained eye, and while I think Mike Mitchell does an admirable job at capturing the style of the first film, there’s a more sluggish nature that infuses this entry. Lord and Miller are masters not only for their one-liners but for also packing the frame with hidden bits of humor throughout. That magical quality feels absent here, which could explain why many scenes seem to languish with a little momentum. There are smart ideas being worked out here, but the direction doesn’t feel as if it utilizes them fully this time around. Much of the returning voice cast provides pretty much the same decent work they showed in the last film. There is a bit of a smile one gets in his dual role as a super-cool version of Emmett that is obviously played like an amalgamation of other badass characters Pratt has played, with a little Snake Plissken thrown in for good measure. Banks, Will Arnett’s returning Batman and Charlie Day’s energetic spaceman are also fun. One weak spot in this ensemble, however, is Haddish. Obviously an incredibly funny person, Haddish just doesn’t truly feel authentic in this world. Her performance feels hollow and distracting, even just as a voice. Truth be told, there’s another actor who shows up later in the film in a somewhat surprise cameo that I wish had been the voice of this character, as it would have made more thematic sense and utilized a performer I truly love. You might agree when you’ve seen the film as well. The films in the LEGO franchise have seen a series of diminishing returns, with a particular low-point being "The Lego Ninjago Movie." This one is a great deal better but still doesn’t capture the heights of the first film. The storytelling in this one doesn’t feel as inventively executed and more of the humor is pedestrian and flat. At the same time, there is enough here to keep one entertained, and it actually finds a nice way to wrap up its narrative themes. Plus, there’s an array of catchy songs that fill the soundtrack that is quite endearing. It’s hard to capture lightning in a bottle twice, but this is a fair enough attempt to give it a try.